Day 4: Of Course We Did! This elevation chart is a screenshot from Guthook’s TRT Guide App. We got pretty darn lucky up on that exposed ridge last night and it was calm…until about 4:30am when the unrelenting wind started. I was so shocked at how well the tent was taking it. I couldn’t even tell which direction the wind was coming from as it whipped at all sides seemingly at the same time. I kept waiting for a stake to come out and nothing even flapped. Unbelievable! We yelled to one another at 5:45am and could hardly hear what we were each saying. Dark clouds were moving in. 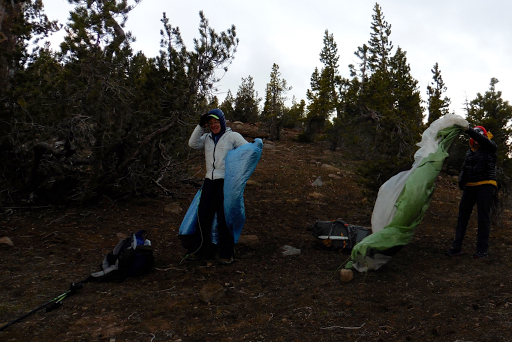 We each packed up in our tents and coordinated it so we all emerged at the same time to take our stakes out and keep our tents from flying away. We were hiking at 6:25am. All of us wore just about every layer of clothing we had including rain gear. My thermometer read 40F, but with the wind whipping, it felt much colder. The lenticular clouds over the lake were further evidence of the high winds. 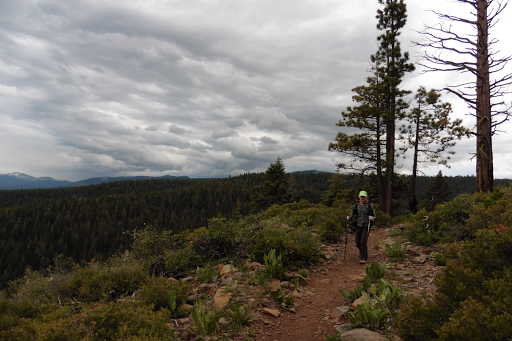 We had a nice extended hike down along a ridge and got more protected from the wind as we descended. 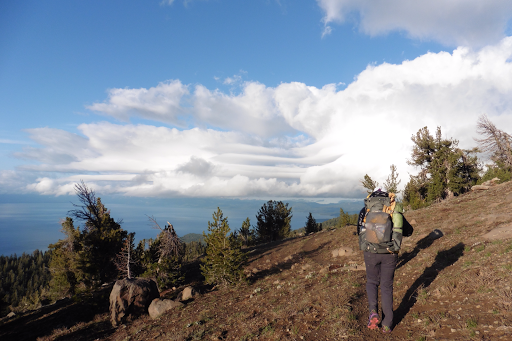 We all have a Mountain Hardware Ghost Whisperer down jacket that we love. I’m jealous of Why Not’s navy one, which wasn’t made three years ago when I got mine. Other than that early ridge walk, the rest of today was in the woods and really relaxing. 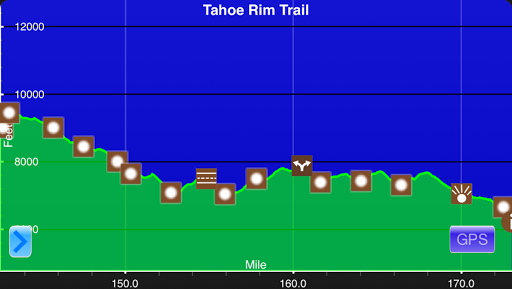 This stretch is probably the easiest extended stretch along the whole rim all the way down to Tahoe City. Our ideal plan was to make it to town tonight. I accepted that it wasn’t happening when we ended up 2mi short yesterday, landing us 30.3mi from town. The weather forecasted for today and tomorrow is more rain and storms in the afternoons. It would have been great to make it to town, but it just wasn’t in the cards. After a few hours, we came across our first fellow thru hiker doing the whole loop. Her name was Katherine and the TRT is her first big solo hike. She is doing the loop in the more common direction going clockwise, opposite us. She also had a tough day yesterday on her first day out with ice rain, but still did a big 20mi day. 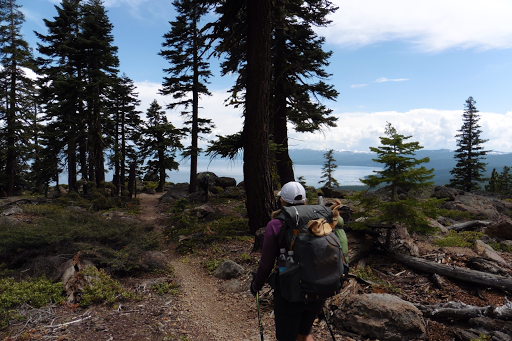 After hearing about our day on Relay Peak, she took our advice to go back to the trailhead and hitch to Tahoe Meadows to skip Relay Peak for now. She can return to it at the end of her hike once it has had some days to melt since she didn’t have a GPS for navigation. 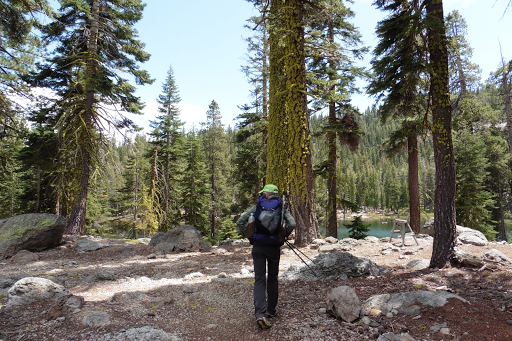 She hiked with us down to the trailhead for four miles and it was fun to chat with her. 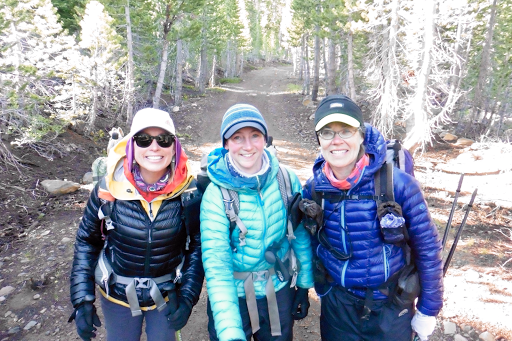 We exchanged numbers and are keeping in touch since we will run into each other again in a few days as we each hike opposite directions around the rim. 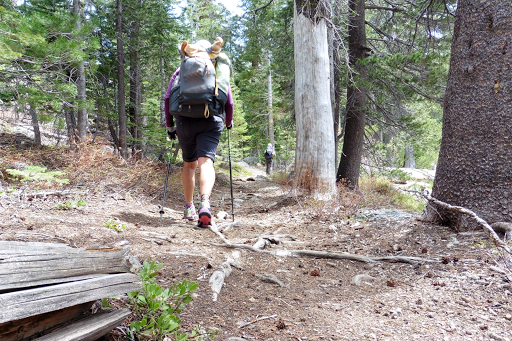 It was great to see a solo gal on her first big hike. Go Katherine! I have to say I’m impressed! I figured this trip would be done as a warm up for Rockin and Why Not’s summer, and didn’t think we’d do a day over 25mi. Doing a 30mi day this early on isn’t easy at all. I’ve got the advantage of having been on trail the last two months, so it’s normal to my body. I don’t know I’d be able to do it on the fourth day out at the beginning of summer like it is for Why Not and Rockin. Rockin’ goes out on badass trips almost every weekend and does these kinds of days regularly for fun ha! 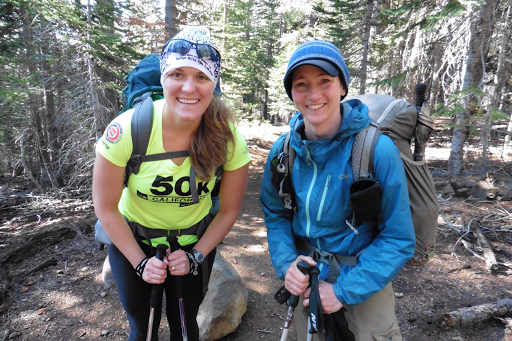 Why Not said she hasn’t even backpacked since doing the PCT (for the second time) last summer! She loves endurance things and said today was more fun for her with this challenge and she really enjoys these kind of enduranced things. She was a triathlete and has done the Kona Ironman (2.4mi swim, 112mi bike, 26.2mi bike) twice, so this is nothing in her mind! Not only did she do them, but she did them well! Her best Ironman time was 11:34 and that’s badass! I definitely saw that spark today and she could have ran to town if she told herself that’s what we were doing. She says each time she does a 30mi day, she wonders if it will be her last. I have a feeling Why Not has countless more 30mi days ahead! All of us knew town would be sooo much better if we got a dinner, hotel, shower, and bed rather than arriving in the morning and just doing town chores without staying overnight. Plus, it was supposed to rain again today and tonight. We decided to hike another 6mi to a stream and lunch and then reassess. We hiked on through the forest and had a good pace to lunch. By the time we left lunch at 2pm, we still had 14mi to go with an 80% chance of showers/tstorms. We knew it was possible, but a lot could happen over 14mi and still weren’t sure we’d make it. We met another small group of thrus coming the other direction and they gave us all the info we need for the rest of the trail. There is some snow, marshy wet areas, and downed trees ahead, that will slow navigation, but nothing terrible. Good to know! Here are the mountains we are headed toward. Once we got down to 8mi remaining, we knew we had it, booked a hotel room, and cruised on in by 7:30pm. It was fun as we got closer and closer to the lake. 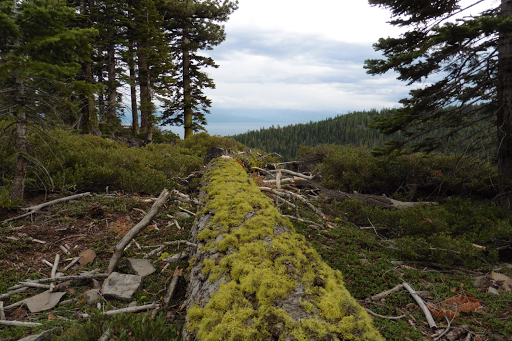 This is the one point where the trail goes down from the rim to Lake Tahoe. It was an additional .8mi of road walking into town, which isn’t a great feeling after already hiking for 13hrs, but it went by fast. It never did rain, but Katherine on the other side of the lake texted to say it did rain on her. It’s all very isolated out here. While we were in sun, we could see dark clouds over much of the lake. We all agreed it was well worth the effort when we sat down to eat. 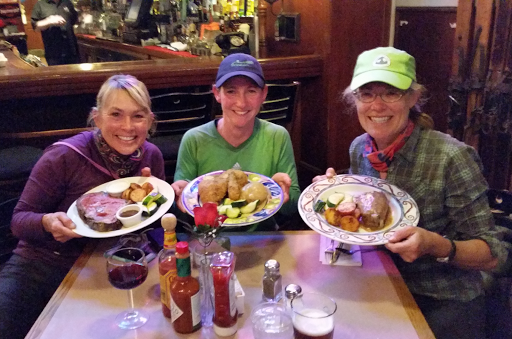 Here we are with prime rib, fried chicken, and pork chops. Yep, pretty darn glorious! We got into our hotel room by 9:20pm and efficiently took showers, cleaned the highest priority clothes in the sink, and have our individual pack explosions in our own corner of the room. Showers and beds felt magnificent. I’m high surprised and completely not surprised that Why Not and Rockin’ wanted to do such a big day so early on. When I really think about it, I don’t know how I ever thought they wouldn’t, ha! They both agree that whatever price their body may have them pay, it was well worth it! These kind of days are what make thru hiking so fun. Love it!